A meal at Kata Rocks is not limited only to the restaurant or your Sky Villa. 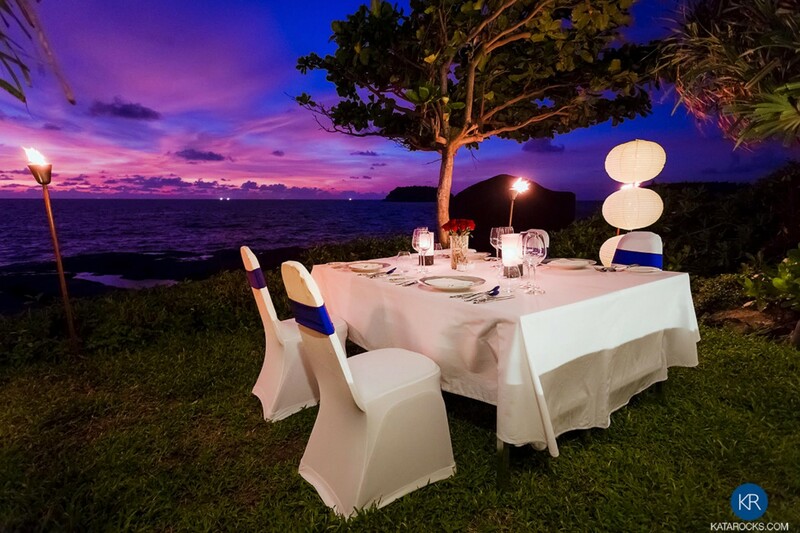 Romantic, seaside candlelit ‘Dining on the Rocks’ fronting the resort, is a favourite with honeymooners or couples in search of the ultimate engagement venue and is available only at Kata Rocks. When you visit Kata Rocks, make sure you bring your appetite. You are sure to find a feast that fits your mood – from delicious tapas to fresh local seafood, from authentic Mediterranean fare to refined Thai flavours, and from elegant main courses to divine desserts. A true culinary masterclass that makes us stand out amongst other romantic restaurants in Phuket. 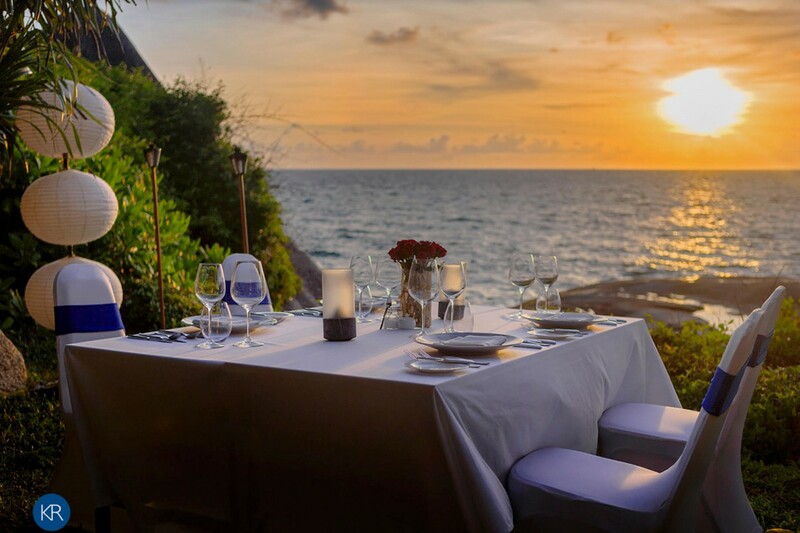 Kata Rocks is the only luxury resort on the island to offer a romantic sunset Phuket dining experience right on the Andaman oceanfront available exclusively with our ‘Dining on the Rocks’ destination dining with set menu options. Custom menus are available in addition to the ‘Dining on the Rocks’ western and Thai set menus. A sample ‘Dining on the Rocks’ set western menu usually features a choice of starters that include roast beetroot with organic greens, slow cooked pork belly seared scallops, slow-cooked smoked salmon potato pancake or seared lamb loin with mint pesto. Main course choices continue a meal of wonderful indulgence: grilled lobster with a lemongrass ginger butter sauce; chicken confit tartlet with seared duck breast; sea bass, tempura prawns and crab spring roll or beef tenderloin with mascarpone potato gratin and foie gras. A shared dessert sampler and seasonal fresh fruits with tea or coffee complete this set menu offering. ‘Dining on the Rocks’ Thai set menu can, of course, include a hit parade of up all of Thailand’s most exquisite regional cuisine. It includes a choice of soup or shared starter sample platter, two selected main courses and shared dessert sampler and seasonal fresh fruits with tea or coffee. The Kata Rocks’ food and beverage team can also assist with any cocktail, wine or beverage pairings to complement the entire dining experience. Our talented culinary team is sure to create a feast that fits the mood of the most special of occasions – from delicious tapas to fresh local seafood, from authentic Mediterranean fare to refined Thai flavours, and from elegant sit-down dinners to divine desserts. 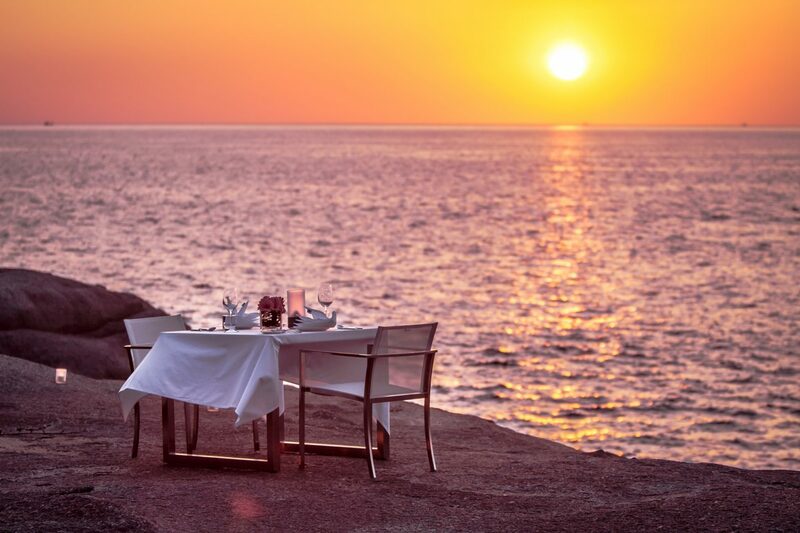 ‘Dining on the Rocks’ dinners are perfect for romantic honeymoons, anniversaries or ‘pop-the-question’ engagements. The ‘Dining on the Rocks’ experience operates on a seasonal basis and subject to weather conditions. For information or reservations email dining@katarocks.com or call (66) 076 370777.